Marketers, don’t get bogged down by technology and buzzwords. The most important thing is the power of creativity, advises Burger King’s global CMO Fernando Machado. "A big idea can change everything. The idea should come first," he says. "That is how we see things here." Burger King’s marketing team is a veritable ideas factory. 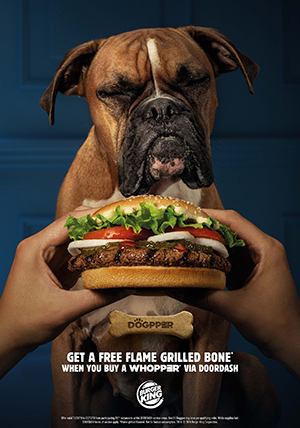 Recent standout campaigns include the Dogpper (a whopper for dogs) and a ploy to get people to order the chain’s food via DoorDash through a series of ads showing photos of real car crashes at Burger King locations. The campaigns were supported by Alison Brod Marketing + Communications, Burger King’s PR partner in the U.S.
Its Whopper Detour campaign told people to go to competitor McDonald’s locations to unlock a deal for a penny Whopper using the Burger King app. "It sounds weird, but we love ideas that are different," notes Machado. The campaign garnered major results for the brand. In the first 24 hours, Burger King took the crown for top app in Apple’s app store in December and saw over 1 million app downloads. The brand’s app was previously ninth in the iTunes app store’s food and drink category. Burger King plans to have ideas hitting the marketplace "every other month, if not every month" to keep people engaged with and aware of its app. 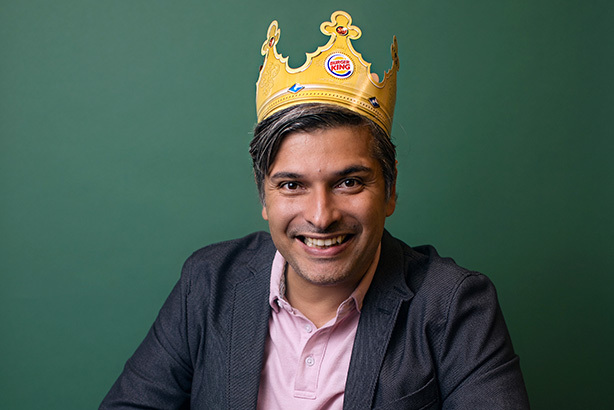 "It is not easy to come up with those type of ideas all the time," says Machado of Burger King’s recent campaigns. "Fortunately, we have a strong marketing team and great partner agencies that help us find those gems with more frequency than other brands in the market." Burger King is not the biggest brand in the fast-food industry, so its resources are limited. Creativity has become a competitive advantage for the chain, differentiating it from others in the marketplace and driving its earned media and "talkability" factor. "Creativity is fundamental to everything we do," explains Machado. "That becomes a dollar multiplier for a brand that has a fraction of the budget of what competitors have." Even though Burger King trolled McDonald’s with its Whopper Detour campaign, and again in January by telling people to cash in expired MacCoins for a free big king XL sandwich, Machado says the brand doesn’t go out of its way to beef with competitors. "It’s more of a coincidence. We don’t brief our creative partners to do a campaign to troll a competitor," he notes. "For Whopper Detour, it took us a long time to find an idea we truly loved to launch our mobile ordering [capability]." In the case of the MacCoin campaign, it was inspired by a product from the competitor, he explains. "Hopefully McDonald’s understands it is just us having fun," he says. "This is not a blunt attack or anything like that. When we make a reference to our competitors, we try to do it with respect." Bantering with competitors on social makes sense for Burger King because it is a challenger brand and fast food is a "fun" category, Machado notes. Even President Donald Trump got a taste of Burger King’s sassy social media sauce in mid-January when he posted a since-deleted tweet misspelling hamburgers as "hamberders." "Due to a large order placed yesterday, we’re all out of hamberders. Just serving hamburgers today," Burger King tweeted in response. The chain’s tweet was "covered everywhere," says Machado, most notably by Jimmy Kimmel, The New York Times, and The Wall Street Journal. When it comes to responding to something in real time, Burger King’s social media team has a fast and nimble approval process. "We saw [Trump’s] tweet with the typo, and when I arrived in the office by 8 a.m., there were already three different suggestions of tweets we could make," notes Machado. "It was a conversation between the North American team and me about whether we want to engage and how we should." The team decided to go with the "most fun" tweet, rather than a political one. "That was just us having fun with a typo," explains Machado. "It is not about us making fun of the president. It could have been anyone. It is not a political statement." Politics, says Machado, is not part of Burger King’s brand positioning. "Our positioning is we like to have fun, we are not afraid of making jokes, and we are good at that," he adds. Although Burger King doesn’t do it, Machado says he isn’t against a brand taking a political stance. "If you are taking a political stance on something that is true to your DNA as a brand, you should do it," he explains. And while most brands have devised a crisis playbook completely focused on what to do if Trump ever utters their name in any sense, Machado lost no sleep when the president gave a one day heads-up to the public about serving Burger King at the Clemson Tigers ceremonial White House dinner. "We were just proud we were among the brands that came to mind for the president [and] we were happy for [Clemson] to experience our sandwich," says Machado. "We just watched. There was not much we could do without sounding exploitative." Aside from promoting new technology that improves the experience of customers, such as mobile ordering, Machado also wants people to know Burger King serves quality food. For him, it’s a personal mission. "I have a 3-year-old named Leo," he says. "I want him to be able to eat at Burger King when he grows up. I need to be proud of that. I can’t have things on the menu I feel he should not be eating." The chain serves 100% beef and cuts fresh tomatoes in its restaurants. But fast food has a reputation for being perceived as worse than it really is, he notes. "Our work focuses on making sure the quality is better and better every day and communicating that in a way that is relevant to the audience," explains Machado. "If we give Gen Z a rational explanation about the fact the food is clean, they will not listen to or believe us, so the challenge is how do I find ways and create materials that will be engaging? It is not easy."